As a photographic concept the Lytro camera never quite made the grade it was far too dear at £1299 but has dropped down to £375 but cameras like the Panasonic GX8, GH4 have kind of caught up with fixing the focus in post. The cinema version of this camera has amazing potential apart from its size (huge)…It reminds me of the camera in Willie Wonka’s Chocolate factory. Lytro Cinema captures all the rays of light within a scene, providing a rich amount of Light Field data. Every pixel has color properties, directional properties, and its exact placement in space. Lytro Cinema is defying the traditional physics of on set capture by virtualizing creative camera decisions. Infinite creative choices can be generated in post-production including unprecedented control over focus, perspective, aperture and shutter angle – recreating impossible shots. The highest resolution video sensor ever designed, 755 RAW megapixels at up to 300 FPS. Up to 16 stops of dynamic range and wide colour gamut integrated high resolution active scanning. Lytro Cinema will be available for production in Q3 2016 to exclusive partners on a subscription basis. For more information on Lytro Cinema, visit www.lytro.com/cinema. Watch the future of television in this short video its fascinating..
Lytro Cinema from Lytro on Vimeo. The trouble with Lytro is that they are very good at hyping up the positive side of their product without mentioning the compromises…..
And the big one with light-field technology is that to get the post-focussing technology involves a trade-off in resolution. In the original Lytro I believe a 16 megapixel sensor gave results of only 1 megapixel. With a lot more pixels on the sensor, then yes, this should offer a far better resolution/refocus smoothness, true. But it raises all sorts of questions about photosite size and sensor size to get that many on a chip. Something which Lytro don’t seem to mention amongst all their blurb……. It’s also worth saying that even the original Lytro gave very big filesizes for what you’d expect from a 1 megapixel photo. So yes, it can be re-focussed in a steppy manner – but it all comes at a price. What the data output of this cinema version would be, I shudder to think. If you find basic 4k video a challenge, don’t even begin to think about it. Further to the above, then when you say “cameras like the Panasonic GX8, GH4 have kind of caught up with fixing the focus in post” then again, it comes at a price – a compromise – which in this case Panasonic tend to keep quiet about. In their case I believe they (fundamentally)simply take a succession of photos in quick succession whilst ramping focus. “Post focussing” is then more a case of selecting the one you want. And again, the focus point will “step” – the compromise here being the more frames for each shot, the finer the “post-focussing” can be. And again, it may be just what someone needs, at least for a still photograph, but it’s hardly translatable into the world of video for obvious reasons. May have usage, but again hardly the future of general cinematography. If something seems too good to be true, it usually is. Here, what Lytro and Panasonic are claiming may well be true – but beware of what they are NOT saying. Don’t simply assume the extra focus etc abilities come at no compromise. I’m not sure why this report got flagged for me in “Top Posts and Pages” after over 2 years, but it got me wondering what had happened with Lytro since. It seems that the scepticism about Lytro I showed in the post above was very well justified, as the company didn’t even manage to survive 2 years after the article above – ceasing operations (and presumably losing $140 millon dollars of invested money?) less than 2 years later in March 2018. Apparently their collapse also led to the loss of all the photos that they were hosting for customers. I can’t say I’m at all surprised. It should be stressed that the light-field concept is sound in principle. 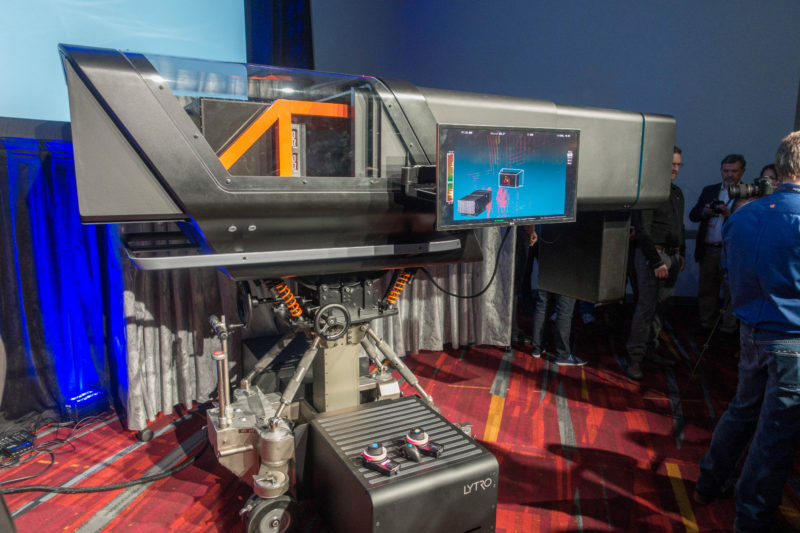 The problems came from Lytro overhyping it’s pluses, and keeping very quiet about the limitations of the technology – which became only too obvious to anyone who bought into them. Light field technology lives on (successfully) for industrial and scientific applications – see under the company “Raytrix” for details. It was for general “photography” (let alone TV and video!!) where Lytro’s claims about it being “The Future of Photography” proved to be so catastrophically wrong.